As I write this post, my oldest children have gone to bed early. As in 7:30 p.m. early. Why? Because tomorrow, our church begins celebrating the feast day of Our Lady of Guadalupe with an early Mass and las mañanitas a la virgen de Guadalupe. Before the crack of dawn, we will be trekking to church to break out in mariachi music in praise of the Blessed Mother. Despite the cold and crazy-early hour, the church will be packed like it is every year for this celebration, people dressed in traditional Mexican garb, little boys donning tilmas like Juan Diego and little girls in peasant outfits. After a vibrant, song-drenched Mass, we will all gather together for Mexican hot chocolates and breads. Perhaps we'll see something new? Last year, we had a play put on by the Guadalupe Club. We'll see what this year brings. 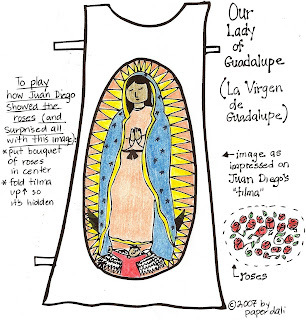 Download the coloring page/paper doll of Our Lady of Guadalupe. 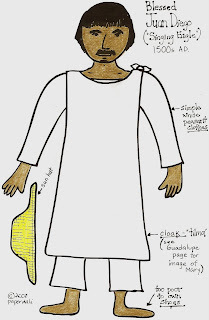 Sash: The position of the sash (it's up high) and the folds in the tunic show that the lady is pregnant. The color should be black, which is symbolic of the Aztec maternity belt. Pattern of the dress: Be sure to draw decorative flowers. The flor y canto pattern (flower and song) connect her to the native people and suggest divine revelation. 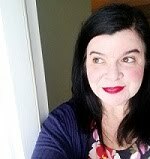 Her dress: A light rose/pale red is for the color of dawn. This color was hugely important to Aztecs, who saw considered the color to be the symbol of life, blood and earth. Stars on the mantle: The eight-point gold stars are arranged as they would have appeared to Juan Diego in the night sky that winter in December 1531. Mary is also known as the Queen of Heaven, hence the stars. Mantle: The blue-green color is the one worn by royalty according to the native people. The gold trim is symbolic of royalty and a person meriting great respect. Moon: The moon was worshipped by the native peopole. By her stepping on them, it shows how the old gods do not exist, only the one god. Color the moon black. Angel: In Aztec culture, only honored people would ever be carried around on someone else's shoulders. The angel supporting the Blessed Mother show that she deserves the highest honors and that even angels care for her. Color the angel wings maroon, gray and blue. Far and wide, the most popular Paper Dali is the very humble and plain Saint Juan Diego. He has already downloaded nearly 300 times in our recent move into the Paper Dali blogspot format. And I suspect he'll continue being Mr. Popularity. The story of how humble and kind Juan Diego was and his extraordinary encounter with the Blessed Virgin Mary ("La Virgen de Guadalupe") resonates with all of us who long to be as obedient, loving and humble as dear Juan Diego. Read more about Juan Diego here. 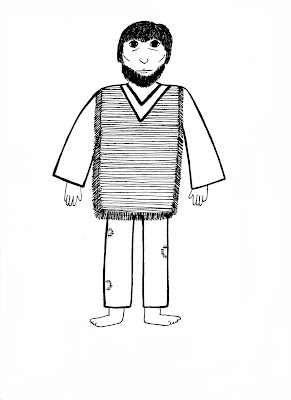 Download a coloring page/paper doll of Blessed Juan Diego. 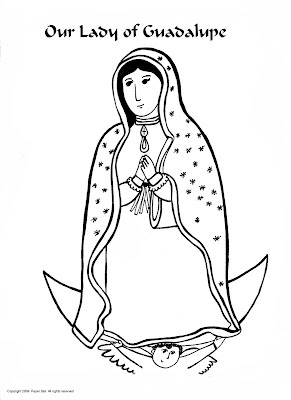 Download a coloring page of the tilma with Our Lady of Guadalupe's image on it. And you'll need Juan Diego's sickly uncle, too, as he is part of this most interesting encounter. Download him here. You'll also need the bishop as part of the story. I was unable to draw the bishop due to lack of time, but you can easily use Saint Nicholas or Saint Patrick, and just color them differently. How easy you have made it for us. Thank you! ¡Viva la Virgen de Guadalupe! As always, Vee, thanks for letting us in to your creative mind! Evann: VIVA! And you're very welcomed. Vee~ We adore this drawing of OLG! Thank you for sharing your gifts with us. We enjoyed our parish procession today:-) Gotta love Mananitas! Hi Vee, I'm stopping in from Homeschool Goodies. I FINALLY linked up. You are truly blessed and so kind to share your talents. We experienced our first Mananitas the other night. Truly lovely! Advent blessings!